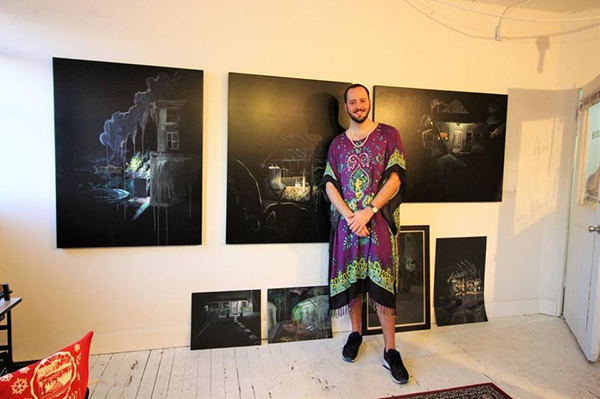 Miami artist Alex Zastera of Studio 84 stands beside his work which features night-time scenes of Miami structures that are in danger of disappearing due to development and gentrification. Locals and visitors on Saturday explored more than 20 art spaces, studios and galleries in Little River and Little Haiti during “Little River’s Night of Light – a 305 Summertime Culture Crawl,” an inaugural event that introduced the public to art and artists within the neighborhoods’ creative spaces. Night of Light was organized by Alex Mitow and James Miille, founders of the JAMM Project, which brings art programming and events to cities. Courtesy of the Miami Herald. Written by Caitlin Granfield.